But while chapters are a useful organizational tool, the ability to refer to specific phrases within those chapters would make the system even more usable.Robert Stephanus (aka Robert Estienne) created a verse numbering system in the mid-16th century and was the first person to print a Bible with verse numbers in each chapter. The merit of his Veteris et Novi Testamenti nova translatio (Lyon, 1527) lies in its literal adherence to the Hebrew, which won for it the preference of contemporary rabbis and induced Leo X to assume the expenses of publication until his death. This version is also notable for introducing verse numbering in the New Testament, although the numbering system used there is not the same as the system used in modern bibles. The history of Bible reference numbers may be interesting in its own right (at least to Bible scholars and history geeks), but it’s also had an important influence on the ways that each of us reads the Bible today. Not everyone is happy with the chapter/verse numbering system—and in fact, it’s worth taking a moment to consider some of the implications of this familiar system. In my experience, when somebody refers to someone – ostensibly to themselves – as a “geek”, they imply that they actually are not informed in the usual manner, but just picked up this information casually. Reader beware. The topic is worthy of further research, because I read that LeFèvre DÉtaples printed a Psalter with verses. And all of this makes me recall that the Masoretic text had verse divisions. But somehow Robert Stephanus won the Bible verse lottery. I don’t know how. Here is some good commentary on the situation from The Reformed Presbyterian and Covenanter, Volume 10 By John W. Sproull, Thomas Sproull, David Burt Willson, James McLeod Willson. page 42. 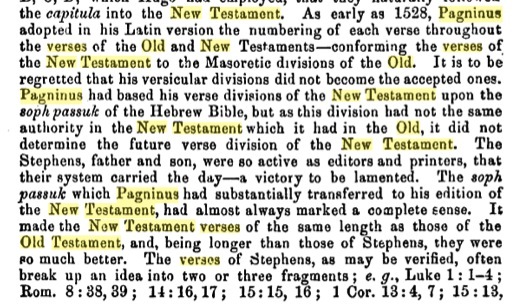 While the verses are not the same as those of Robert Stephanus, nonetheless, the Latin Bible of Pagninus, 1528, was the earliest complete Latin to introduce verses, as far as I have heard so far. Weird how elusive it is. I can’t even find a scanned copy on any of the usual sites. I have photos of the book of Genesis, but they are from a later edition, so I have not made them public. I also own a Pagninus Psalter printed in the 17th century. I believe that somebody ought to make a digital copy available, but there seems to be no interest. This is brilliant! I have been wanting access to a Pagnini Bible for a long time. It is the only completely independent Latin translation other than Jerome’s. I argue that it is the most influential Bible translation of the Reformation, or pre-Reformation, one might say.